The local currency’s performance is reaching new lows as its year to date depreciation puts it among the worst-performing currencies in the emerging markets. According to the Bank of Ghana’s interbank exchange, as at February 1, the cedi had depreciated by 2.6 percent against the US dollar, compared to the 0.1 percent appreciation in the same period last year. Last year, the cedi depreciated by 8.4 percent against the dollar in what the central bank attributed to strengthening of the US dollar against currencies in emerging and other frontier markets. But the cedi’s start to the year has weakened so much that it’s performance against the US dollar is among the worst compared to other emerging currencies, data from Bloomberg currencies have shown. Bloomberg, which measures the performance of currencies worldwide, puts the cedi’s performance at YTD depreciation against the US$ at 3.87 percent; while other emerging currencies in the sub-Saharan Africa region fared better. The South African rand has since turn of the year appreciated by more than 7.2 percent against the US dollar, while the Nigerian naira has practically stayed the same, 0.0 percent, versus the greenback. The Turkish Lira has appreciated 1.35 percent; the Indian Rupee has depreciated by 2.87 percent; with the Chinese Yuan and Argentine Peso appreciating 1.98 and 1.13 percent respectively against the dollar. The central bank Governor, Dr. Ernest Addison, told the press last week after the MPC meeting that the cedi’s performance can only be measured within the context of what is happening in the emerging and developing markets. “Even though the cedi depreciated by 8.4 percent, if you compare it with the developments from other emerging and frontier markets in 2018, the cedi did relatively well. If you take Argentina, the peso recorded a depreciation of over 50 percent; Turkey, a depreciation of over 28 percent; Russian Rouble, 17 percent. “That’s the context within which one can judge performance of the cedi in 2018. 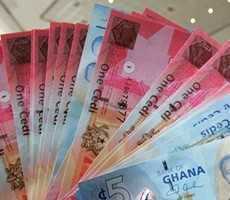 The Ghana cedi did relatively well,” said the Governor, seeking to explain the cedi’s performance last year. Nevertheless, last year’s relatively stable performance had come at a cost – the bank’s international reserves was depleted to prevent the cedi from falling further. According to the central bank’s Summary of Economic and Financial Data, January 2019, Ghana’s net international reserves declined from US$4.5billion in December 2017, to US$3.85billion a year later. Explaining the decline, Governor Addison said: “You need to make a judgement; a little bit of reserve reduction in order to save the currency. But you also don’t want to lose all your reserves in trying to save the currency. It is important not to unwind all the gains we achieved last year. “We spent two years in bringing inflation down from over 15 percent to 9.4 percent; if we allow the exchange rate to move too fast, we are going to negate the progress we have made in terms of price stabilisation. So, that’s why we had to lose reserves to moderate the speed of currency depreciation.